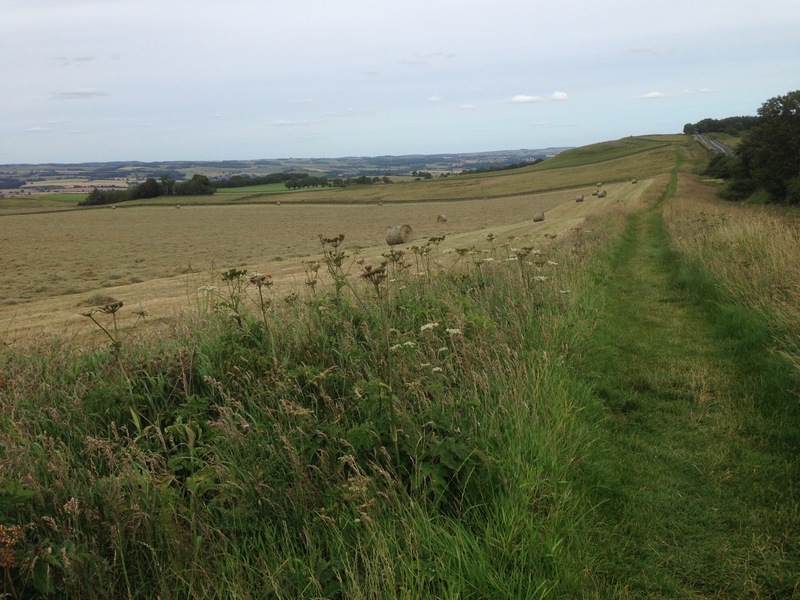 We walked from Brocotia to Limestone Corner. It was the rarest day for the North East, warm, bright and even the breeze was not bracing! 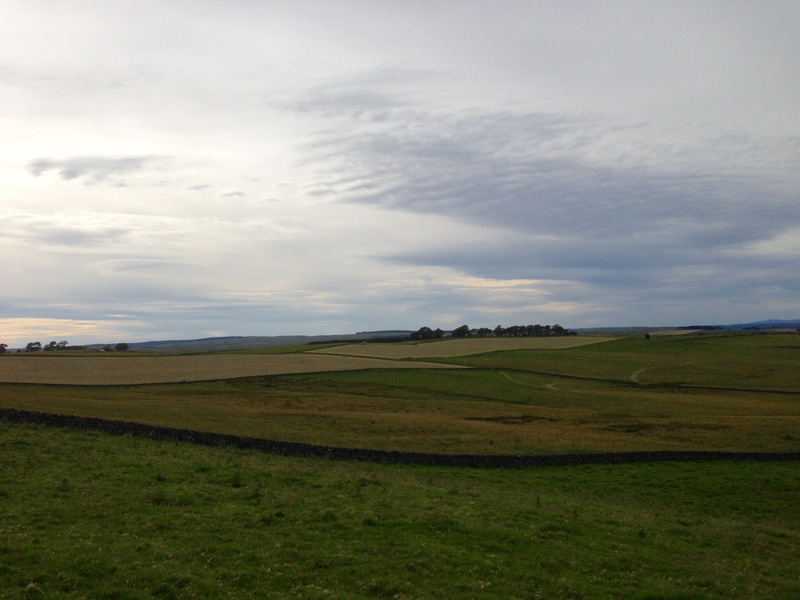 This was my first time walking any part of Hadrian’s Wall. Looking north towards Scotland, the Cheviots about forty miles away, rose gently in the background. The land rose and fell too, as Turgenev would say, like waves coming towards us. The hay, on some fields, had just been cut, and lay in bales. The patchwork of the fields was brown, golden through to green. Dry stone walls separated the fields. A solitary crow picked at the earth. But if you looked closely enough there was another in the brush. I crossed to the Isle of Britain in a ship, which was flat as a badge. More than once the wind threw us back toward the coast from which we had sailed: that difficult passage afforded some wonderfully vacant hours […] The civil reforms effected in Britain are part of my administrative work of which I have spoken elsewhere. What imports here is that I was the first emperor to settle pacifically in that island situated on the boundaries of the known world, where before me only Claudius had ventured for several days’ time in his capacity as commander-in-chief. For an entire winter Londinium became, by my choice, what Antioch had been by necessity at the time of the Parthian war, the virtual centre of the world. Thus each of my voyages changed the centre of gravity for imperial power, placing for some time along the Rhine, or on the banks of the Thames, and permitting me to estimate what would have been the strength and weakness of such a capital. That stay in Britain made me envisage a hypothetical empire governed from the West, an Atlantic world. Such imaginary perspectives have no practical value; they cease, however, to be absurd as soon as the calculator extends his computations sufficiently far into the future […] I myself inspected a substantial part of those constructions begun everywhere at the same time along an earthwork eighty miles in length; it was my chance to try out, on that carefully defined space running from coast to coast, a system of defence which could afterward be applied anywhere else […] This rampart became the emblem of my renunciation of the policy of conquest: below the northernmost bastion I ordered the erection of a temple to the god Terminus. Our walk was on a mound, the wall, I suppose sitting underneath us. To the south was a ditch, and to our North the aggressive Picts, flame-haired and with painted bottoms, newly aroused to warfare could just about be seen in the imagination. Jan pointed out meadow sweet, harebell, also vetch, buttercups, dandelions, thistle. 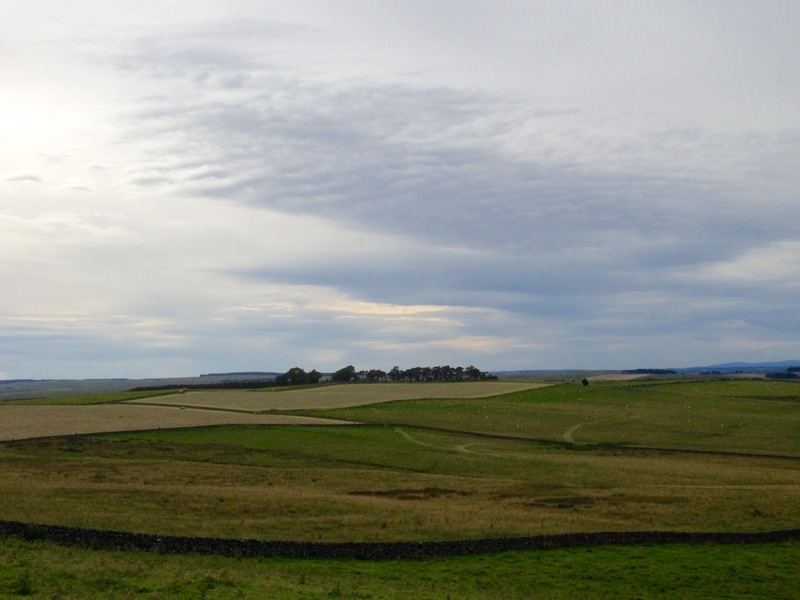 You could say that it was typical Northumberland; black-faced sheep, cattle standing stock still or resting on their haunches, the sky midsummer autumnal in its width and depth, grey, light blue, and puffed up clouds. The odd car noised by on the sunken road that was mostly out of sight. 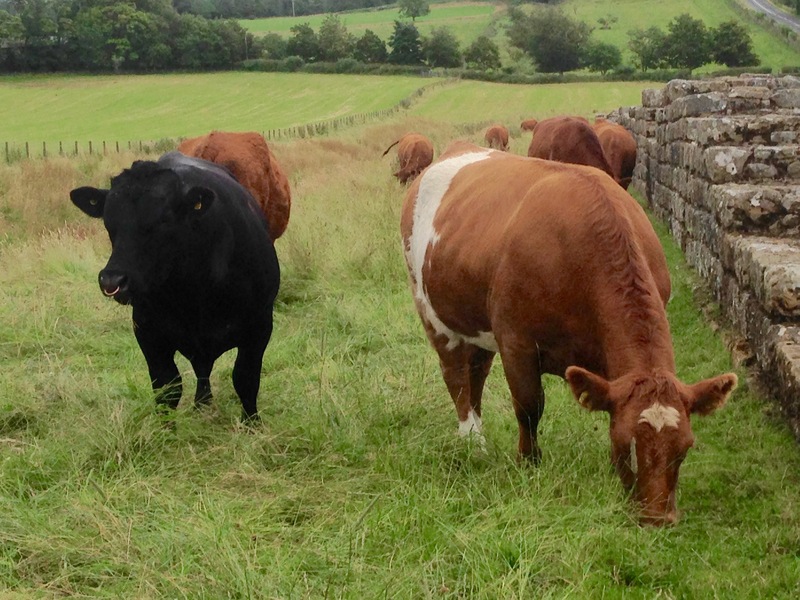 Our only adventure was when a black bull surrounded by cows charged at us, showing off to his harem! Luckily we were on the other side of the fence separating us from the field. Defence of the realm and territorial integrity became at once and menacingly. We walked back to the car, retracing our steps. Walked past another line of cattle. They ignored us, swished their tails, absently eyed us. Once we were out of reach the bull mooed, once, twice, thrice. What was that about? 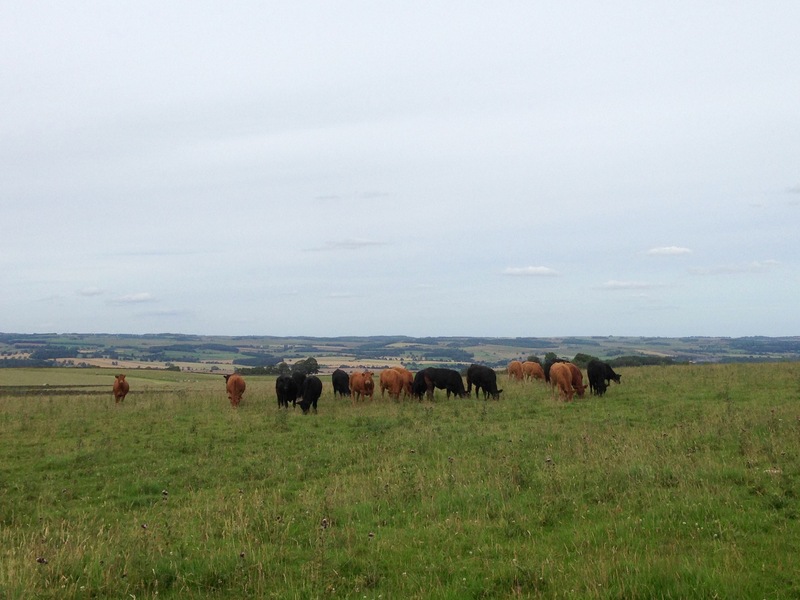 A line of cattle formed, facing us and silently watched us depart. Like good riddance to bad rubbish.